From my experience, English is one of the richest language in words to describe jam-like products. We have marmalades, jams and jellies before we move on to curds and cheeses. Having so many words it is obviously important to the British.Today I wanted to talk about my favourite, lemon curd. They say the way to a man’s heart is through his stomach, I can definitely say that it works for at least some women too. I am sure that the girl who later became my wife was at least partially won over by the jar of lemon curd I gave her. She had come back from a visit to a local garden centre and had bought a jar of lemon curd. I convinced her I could do better…… I must have been right! Even today, more than twenty-five years on, little has changed. Whilst she was testing the latest batch, she was extolling its virtue between mouthfuls of the yellow nectar. Comments like “One of my most favourite things in the world” or “I don’t believe there could be anything better in the whole world” being just two typical examples. In late 19th and early 20th century England, home-made lemon curd was traditionally served with bread or scones at afternoon tea as an alternative to jam, and as a filling for cakes, small pastries and tarts. 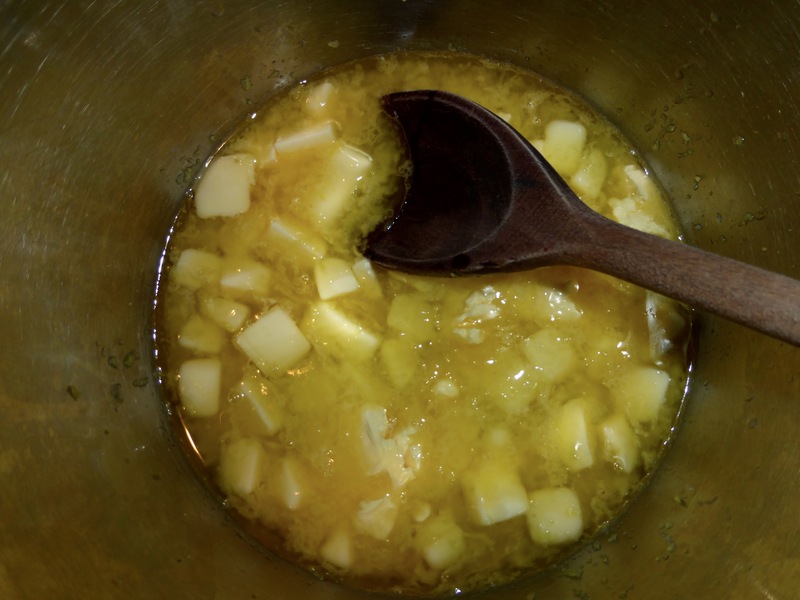 Homemade lemon curd was usually made in relatively small amounts as it did not keep as well as jam. In more modern times, larger quantities became possible because of the use of refrigeration. Curds differ from pie fillings or custards in that they contain a higher proportion of juice and zest, which gives them a more intense flavor. For me the key point is in the very last line where it mentions an intense flavour. A good lemon curd has an intense yet balanced flavour. I always put butter into mine, others do not. I prefer the finished product that way plus, as it already incorporates the butter, it can be spread directly on the bread. 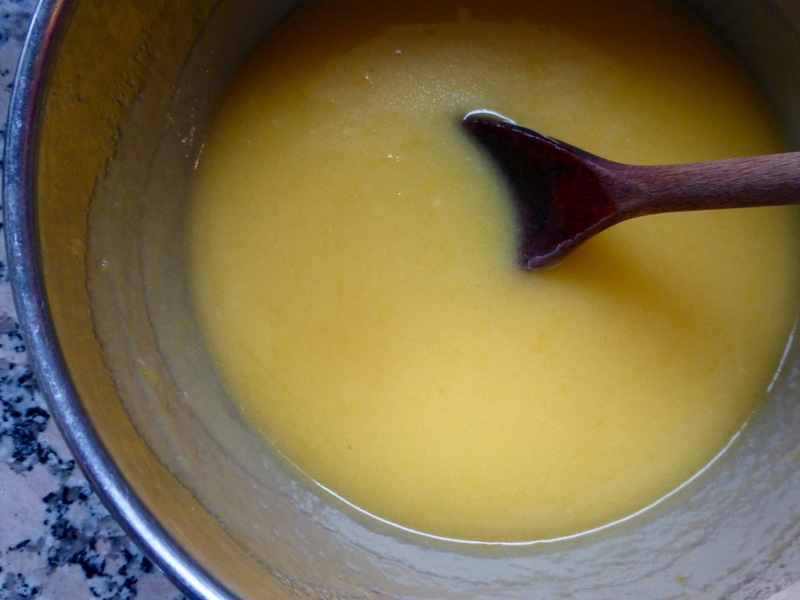 Lemon curd is, as describe above, also good as a filling for cakes or tarts. Shortly I will be posting one of my favourite lemon curd tarts. Some recipes also either add cornflour or use just egg yolks in an attempt to stop the product curdling. I personally have never found the need, my lemon curd never having curdled. I always cook over a water bath though which I believe is key. 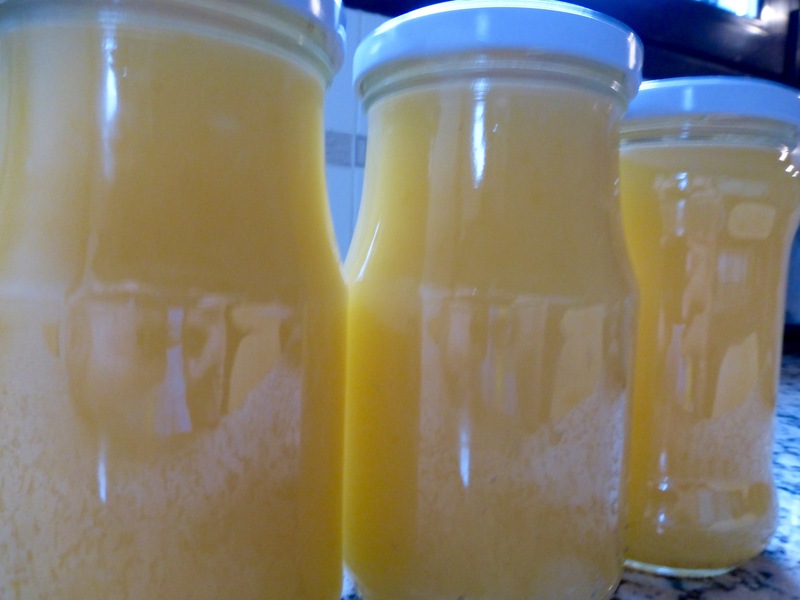 I would encourage you to give it a try, home-made lemon curd really is delicious. As I mentioned earlier the key to this recipe is the water bath. I simply use a relatively large pan and sit a bowl in it. I put enough water in the pan to reach the bottom of the bowl and set it going at a medium heat. To check the set you can put a metal plate into the freezer to chill. Finely grate the lemons avoiding cutting into the pith. Put the juice and the grated lemon rind into the bowl. Dice the butter into the bowl and heat until it has melted. 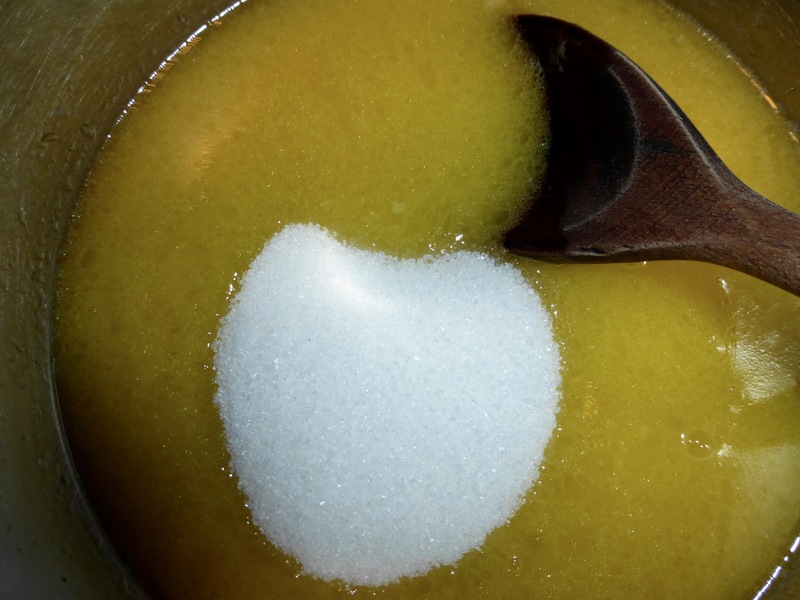 Add the sugar into the bowl and just dissolve. Do not overheat the mixture, we don’t want to cook the eggs which come next. Beat the eggs then add into the bowl. Heat gently, stirring constantly without boiling until thick. This requires a little care and is the only difficult part of the whole recipe. Initially the mixture should give little resistance to the stirring, it should feel a little like stirring milk. Depending upon the temperature, within five to ten minutes you should feel more resistance until it starts to feel like stirring thick cream. At this point it should be ready. One quick test is to put a teaspoon full onto a chilled plate in a freezer. In a couple of minutes it should stiffen up and have a jam-like consistency. Pour the curd into sterilised jars. I recommend you keep the lemon curd in the fridge. In theory it should last about a month, but in this house at least the end date has never in fact been tested. There’s really nothing quite so nice as home made lemon curd. Ann makes it quite often and it’s so nice on brioche, scones (I make those) or pancakes (scotch or crepes). We find it lasts well in the fridge. We only ever eat it at weekends so it lasts well over a month. Thanks for the comments. I prefer dialogues to a monologue on my part! I agree wholeheartedly, I prefer Lemon Curd to just about any other spread and yet it is relatively unknown. I wanted to touch on red peppers next time, given that last time I talked about the green ones……. but the post after that will be on a cake I make with Lemon Curd. Get Ann to make some curd so that you can try my cake recipe!